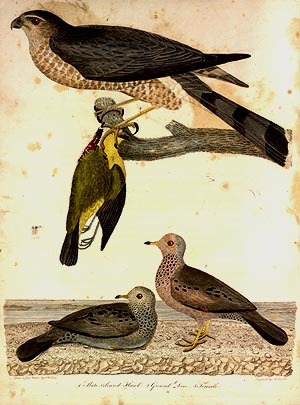 This elegant and spirited little hawk is a native of Pennsylvania, and of the Atlantic States generally, and is now for the first time introduced to the notice of the public. It frequents the more settled parts of the country, chiefly in winter; is at all times a scarce species; flies wide, very irregular and swiftly; preys on lizards, mice, and small birds, and is an active and daring little hunter. The dove, generally speaking, has long been considered as the favourite emblem of peace and innocence, probably from the respectful manner in which its name is mentioned in various parts of the Scripture; its being selected from among all the birds by Noah to ascertain the state of the deluge, and returning to the ark bearing the olive leaf, as a messenger of peace and good tidings; the Holy Ghost, it is also said, was seen to descend like a dove from heaven &c. In addition to these, there is in the dove an appearance of meekness and innocency very interesting, and well calculated to secure our partiality in its favour. These remarks are applicable to the whole genus, but are more particularly so to the species now before us, as being among the least, the most delicate and inoffensive of the whole.